I was dreading the moment when my son, L, would declare that he felt a loose tooth in his mouth. I’ve heard horror stories from other parents, who have a child on the Autism Spectrum, about this stage of life. 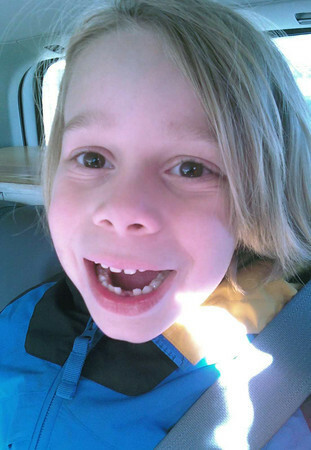 Something as simple as a loose tooth can force a child on the spectrum to not eat for days because they don’t like the unfamiliar feeling of the loose tooth in their mouth or suddenly having anxiety about sleeping for fear of swallowing the tooth. I did what I know works for my son in order for him to not have anxiety about something; I put the knowledge in his hands. I filled our bookshelf with an arsenal of information from the library on tooth anatomy - he needs these questions answered correctly and given to him with scientific proof. In the back of my mind was the issue surrounding the “tooth fairy.” How I was going to handle that? See, L doesn’t lie. He doesn’t understand the concept of it. Life to him is very black and white with no gray area at all. And when someone doesn’t tell him the truth he loses trust in them. There have only been a handful of times when I’ve felt like this “no lying” thing smacks me in the face. Right before Christmas we began a new family tradition, Elf on a Shelf. The idea of the Elf on a Shelf is that the Elf watches the kids during the day and at night flies back to the North Pole and reports to Santa on the status of the children’s behavior. Every day the boys woke up and went looking for Happy, our elf, to find his new hiding place. Since Happy came into our lives, L has a new anxiety of stuffed animals watching him. Big oops! He has to turn all the stuffed animals around so that they don’t watch him in his room while he plays. Part of me wants to be honest with L about Santa, the tooth fairy, the Easter bunny and the other part of me wants to enjoy the magic that those make believe figures brings to childhood. I love the idea of believing in something as simple as the tooth fairy and the land of make believe when we live in a world that is filled with negative images. I grew up believing in them and at some point a friend leaked the truth about finding the presents marked from Santa under their parent’s bed, or recognizing that the tooth fairy’s handwriting was very similar to my mom’s. How would you handle the balance of telling the truth to one son while allowing the other son to believe in the lies? Parents who have children with a large span of years between them: are you in a similar situation? Have you had to fess up and tell the truth?